...to the day I hiked into Kennedy Meadows. I just stumbled onto an interesting article, Stuck in the Sierra, showing up in the list of PCT News section of my blog, and--in particular--the words Fox Mill Road. That reminded me of my post Into Kennedy Meadows--in which I found some strange messages taped to posts about there being an emergency and to call Sharon's parents for help. I did nothing--seemed counter productive to scare the crap out of Sharon's parents, and anyhow, my cell phone didn't work there anyway. But I remember the note saying something about Fox Mill Road, and it seemed a pretty bizarre coincidence to find an article that happened to mention this road. So I read the article, and it mentions Sharon and Cheater--the same names that showed up on the note! Holy cow! This is them! =) Finally, I know the whole story about those mysterious notes and what happened! In a nutshell, they were in a truck that got stuck in sand, then eventually hiked out far enough where they got a cell phone signal themselves and called 911 for help. We were nearing the ridge below the repeater when we were surprised to see a pair of hikers sitting beside the road – and they knew who we were. 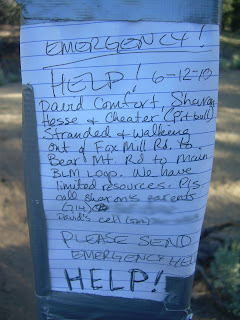 They had seen the HELP notes we left on the Pacific Crest Trail markers. While we were talking, another hiker appeared, striding toward us. He looked neither left nor right as he powered past us and up the trail, disappearing behind a curve. Sharon and I had seen no one for days, and right when we'd run into a pair of people, another one just happens on us. And he doesn't say a word. Doesn't he know we're in trouble? Doesn't he know that human connection can make the difference between life and death? Doesn't he? No, of course he doesn't – his perspective is not ours. He's not in trouble, and to the casual onlooker, neither are we. If those people had truly been in trouble then wouldn't most think they would yell out to the lone hiker, "hey, which way do we go? ", or "hey, can you help us? Have you got a cell phone? " that sort of thing. Instead the couple that were supposedly lost, in trouble, whatever, put this lone hiker down because he probably surmised they were just fine and kept to his own course. If you're in deep trouble you will do anything to get ones attention, any one that crosses your path, lacking malicious intent in their body language as an exception...just my 2 cents..
OD, I couldn't agree more. It's the same reason I don't usually stop at a car on the side of the road. If they're sitting inside the car listening to the radio I assume they're waiting for someone to arrive who has already been notified. If they are under the hood my limited automotive knowledge isn't going to help any. If they seem to need medical attention I always stop but, honestly, that's pretty darn rare. If someone is bad enough off to write a note like that and mean it then they would be calling out to anyone who has even a slight chance of hearing them. Maybe it was you, maybe it wasn't. But why didn't they call out for help if they needed it. If I had walked by a group of hikers talking, I wouldn't have stopped to chat unless 1)I knew them, or 2)They spoke to me. Well at least they ended up ok.
hello, all. i'm david comfort - one of the two people in trouble in this scenario. i think it appropriate to lend a little perspectiveto the discussion, which perhaps would be clearer if the rest of the article could be read. at this point in events, sharon, cheater and i had climbed high enough to get cell reception, and we had connected with the kern county sheriff's department about half an hour earlier. so the circumstances did not seem as dire to us as when we'd written the 'help' notes that morning. please consider that it's easy to analyze decisions and parse circumstances from the comfort of your chair in front of your computer at home, but sharon and i less than 12 hours earlier had been making decisions based on preserving our lives. and that mindset doesn't just click on and off. re the hiker who walked by, i acknowledged he had no reason to suspect trouble. no one is leaving him on the hook. Hey, David and Sharon. Welcome to my little piece of the Internet. =) I was wondering who you bumped into, and as it turns out, I was right--I did know them! Well, Sticky Fingers, at least. I never actually met Happy Joe, her husband, since he hadn't met up with her on the trail when I met her. hey ryan - since you never met happy joe, and seeing as how you were going the distance on the PCT, the guy who passed us surely wasn't you. he looked like a day hiker - he had almost no gear. this article has certainly produced some unlikely connections from people who passed through the area. it also got me an email from a hunter whose vehicle had gotten stuck in the exact spot as mine a few years before. it was december, and he walked out to keep from freezing to death. when we went in a few weeks later to winch out my truck, we dragged fallen trees across the road to close it off. which should have already happened anyway, since it was in designated wilderness. Check out:"Running Bear at the Carson Gap"